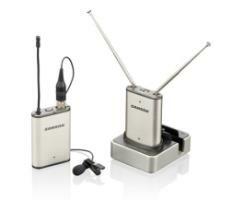 A high quality, small portable unit that can transform any analog microphone into a wireless microphone. We recommend adding a SpeechWare Flexymike. 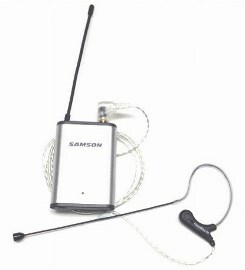 The Samson Airline Micro Camera Edition is a new wrinkle on the Samson Airline Micro which is a popular small portable wireless microphone with one limitation; it includes a non-replaceable wireless microphone. The biggest advantage of the new Samson Airline Micro Camera is that it will allow you to convert any analog microphone (terminating in a standard 1/8 inch plug) into a wireless microphone. Our favorite microphones, to pair with the AirLine Micro are the FlexyMike SE and FlexyMike DE headsets because they're very lightweight and comfortable, as well as accurate. The Samson AirLine Micro Camera is a completely self-contained wireless unit which includes built-in rechargeable NiMH batteries in the transmitter and receiver. It has professional look and feel, is very small and doesn’t require an AC outlet. 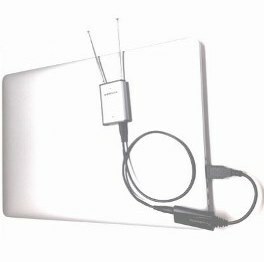 The transmitter includes a belt clip but it is so small, we prefer to drop it into any available pocket. The AirLine Micro Camera Wireless System utilizes the latest in lithium-ion battery technology and high-quality audio and RF components, representing a breakthrough that is ideal for all video camera applications requiring outstanding audio, including DSLR video. The result is our smallest wireless system ever.To eliminate continually changing batteries, Samson has designed this wireless system to be fully rechargeable with lithium-ion batteries for both the AL2 transmitter and AR2 receiver. The AR2DT double-docking station provides power to both units via a USB DC input, as well as a 3.5mm balanced audio output for the receiver. With AirLine Micro, the days of replacing batteries in your wireless camera system are over. In addition to DSLR, AirLine Micro can also elevate the versatility and convenience of most camcorders on the market. In many cases, smaller camcorders are designed with their microphones mounted in some of the most awkward locations for capturing audio. Depending on the camera, these units also feature "wind reduction" functions that often muffle the level of audio straight across the board. But with AirLine Micro and its wireless lavalier mic, camcorder videos can be filmed with pro-level audio. When pro-level audio is a must in your camera application, Samson’s AirLine Micro Wireless System offers the most discreet and convenient wireless camera solution available.